Home > Floral Decor > Flower Bouquets & Sprays > Flower Garland with Bead Clusters "Kaleen" - White 70"
White Flower Clusters mixed with Crystals for Hanging Floral Installations - Weddings, Photographic Backdrops & More. Each strand is 70" long. We want your special day to surpass your dreams so we've searched hard to find some absolutely stunning flower garlands that can be used in a multitude of ways! One fashionable trend is to hang garlands from ceilings and overhead structures, creating a sophisticated venue that showers you and your guests in a romantic floral wonderland! The photos show this garland hanging side by side with multiple sets. This item is sold by the strand. So if you order 1, you will get 1 garland. They are also so very beautiful mixed together with our other hanging flower garlands. 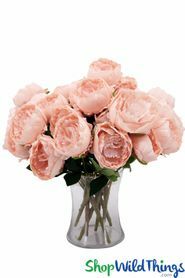 Flowers add energy and are an essential decorating element for any event. Our 70" long Hanging Flower Garland "Kaleen" will create that romantic tropical setting to take your event to the next level! This garland is so distinctive and classy! Strung on clear monofilament line, clusters of snow white petals interspersed with green leaves, alternate with clusters of clear beads. Each cluster is about 5" long and this mix of colors and materials make this a very attractive and unique garland. The textured petals rotate around the strand and this garland is 4" wide. You can fluff the petals to increase the fullness. 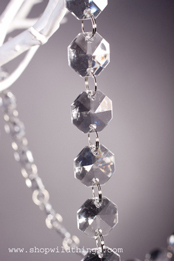 There is a crystal clear faceted bead at the end to add weight. 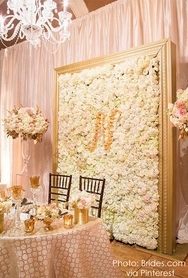 This garland can be hung vertically or horizontally and the flowers can be viewed from any angle. There's a 2" flexible silver wire hanging loop so you can have instant glam right out of the box! Whether your event is inside or out, this garland is perfect for weddings, celebrations, garden parties, window bling or for adding some positive charm and harmony throughout your home. For an outdoor ceremony, create an intimate togetherness by seating your guests under a magical hanging garden that's luxurious and relaxing. 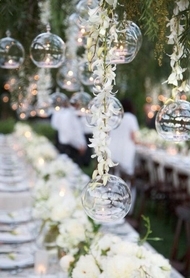 You can add to the romantic ambience by adding hanging glass candle holders or hanging crystal garlands. Beautify a balcony or outdoor tents, highlight a pavilion, trellis, pergola or gazebo, enhance centerpiece trees and wedding arches. This is an ideal choice for using with a green vertical landscape wall mat to create a beautiful background for the head table which can then double as a photo backdrop. You could also just lay it down the center of a table, drape along the front of buffet tables or even use to decorate a cake. Happy guests enjoying your blissful floral wonderland! Good job!